Zarinkelk Engineering Services provided QA/QC review services for site civil design elements for the site development plans for the Harmony School of Austin. The proposed school is located on FM 620 just east of Lake Creek Parkway. The school including classrooms and cafeteria has 83,450 square feet under roof and sits on an 8.3 acre lot which includes parking and landscape improvements. Review included basis of design and improvement capacities for paving, drainage, detention, water quality, potable water, and wastewater systems. This project involved a capacity determination for the High Service Pump Station 3 (HSPS 3). Included in the analysis were both existing and future proposed storage tanks. An extended period simulation was run with this model to determine the impacts of future demands and the effects on the system of an additional ground storage tank. 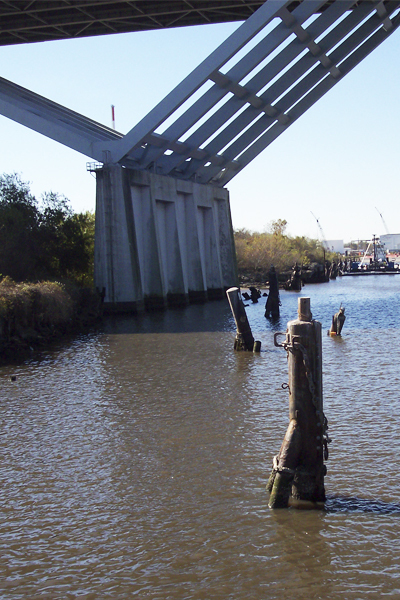 ZESI provided engineering design services for the rehabilitation of the bridge and dolphin located at the Bulk Materials Handling facility damaged during Tropical Storm Allison. Plant is located where Greens Bayou enters the Houston Ship Channel. This project included review of the damage caused by Tropical Storm Allison to the Bulk Plant dock area when barges were pushed into the dock facilities by incoming waves. The damages required demolition of a portion of the bridge’s outer edge and the ends of the pier bents and caps and replacement with new concrete, hubs and railing. Design efforts also included repair of the concrete bridge deck, removal of the damaged fireboat timber dock, and repair of the birthing dolphin at the Lay Berth pier. ZESI provided engineering services for the repair of the Brightwater Outfall structure. The Brightwater Outfall Structure is located on one of the tributaries to Oyster Creek in Missouri City, Texas, north of Highway 6 between Brightwater Point Estates and Lakeside Meadow at Brightwater. The Addicks Park and Ride Project will prepare that facility to interface with the work currently underway in IH10. The project includes design modification of the existing facility, demolition of the existing T-ramps and underpass, design of an access driveway, a re-design of parking spaces, design of a new bus ramp to the proposed HCTRA/TxDOT managed lane, relocation of security cameras, reconfiguration of utilities, design of traffic control and development of the PS&E package. The project involved close coordination with the City of Houston, HCTRA and TxDOT and their design consultants for the proposed Park Row Blvd. and the IH10 project. The probable construction cost is $1.8 million. Under contract with METRO, ZESI was sub consultant for the re-designation of five of the existing High Occupancy Vehicle HOV corridors –IH 45 North, US 59 North, IH 45 South, US 59 South and US 290 – to High Occupancy Toll (HOT) Lanes. The project entailed the design, installation and operation of electronic toll collection and optical monitoring equipment. The new electronic system will maintain the desired level of service for HOV users, provide better controlled access, improve safety and maximize lane use by allowing single occupant vehicles access for a fee or toll. METRO will operate under agreement with TxDOT. ZESI worked as sub consultant on Uptown and Southeast (SE) corridors preparing utility plans, and developing various route alternatives for both corridors of the light rail project. ZESI worked on submission of the SUE plan and profile, prepared CAD drawings (Using Microstation V8), and developed underground utility plan and profile drawings highlighting conflicting utilities. ZESI assisted other CAD group members with the development of new “Cut Sheet” batch plot program using GeoPack (an extension of Microstation) to produce output more efficiently. ZESI also has developed a Houstorm drainage model for the uptown project. ZESI assisted as sub consultant with the preparation of constructions drawings for security cameras and related items for the City’s wastewater treatment plants. ZESI used AutoCAD Civil 3D and Adobe Acrobat to modify existing drawings for the following WWTP facilities: Chocolate Bayou, Southwest, and FWSD # 23. © Zarinkelk Engineering Services, Inc. All Rights Reserved.